Candidates, are you searching for MVC Quiz? Then you are at the right place. 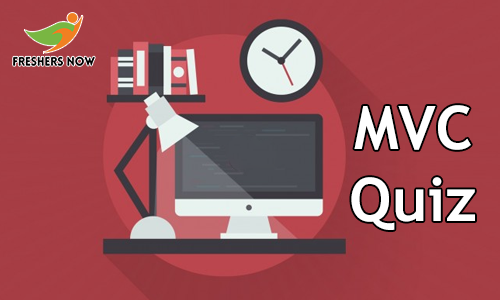 Our article provides you with MVC MCQ Online Test with leading MVC Objective Type Questions and Answers. Hence, aspirants, those who want to attend campus interviews can practice the quiz. Also, we suggest the aspirants check the whole article for more important stuff like benefits of taking the online test, models of questions asked in the exam, type of questions, etc. Moreover, let you know that the questions that we are providing in this post are collected from experts. Therefore, candidates can practice the MVC MCQ Online Test without worrying. Before attending an interview, candidates can practice the previous papers or mock tests to qualify for the interview process. Here we are providing you with the complete details in the article about the MVC MCQ Online Test. The test contains 30 questions for 30 marks with no time limit. As mentioned earlier this is a Multiple Choice Questions type exam. So, after the completion of the test, candidates have to remember that he/she should click on SUBMIT TEST. Otherwise, your answers will not be submitted. Furthermore, contenders should not refresh the page until the exam is completed. 1. What is RouteConfig.cs in ASP.Net MVC? A. RouteConfig.cs is used to register MVC config statements, route config. B. RouteConfig.css is used to register global MVC bundles. 2. RedirectToActionPermanent() Method for which Status code represents? 3. For controller action method . . . . . returns nothing as the result. 5. Which is the best approach to assign a session in MVC? 6. Which Namespaces are required to Data Annotation using MVC? 8. RedirectToAction() Method for which Status code represents? 9. Does TempData used to pass data from one page to another page in MVC? 10. Which is more faster between ASPX View Engine and Razor View Engine. 11. . . . . . helps you to maintain data when you move from controller to view. 12. Viewstart comes under which folder name ? 13. In which format data can be return from XML into table? 14. What Request Processing technique follows ASP.Net ? 16. What is the extension of MVC view when using C#? 18. How can we set theme to MVC Charts? 19. You can use . . . . . class to send the result back in JSON format in MVC. 20. Which Namespace is used for ASPX View Engine? 21. How to set Default Value to Hidden Input Box using ASP.Net MVC? 22. How to Print value from Controller to View in MVC ? 23. Does MVC 6 introduced new JSON project based structure? 24. What is the name of default Viewstart Page in ASP.Net MVC? 25. What is the benefits of Html.Partial using ASP.Net MVC Razor Engine? A. @Html.RenderPartial Returns response, moreover requires to create action. B. @Html.RenderPartial Returns string value, it is slower than @Html.RenderPartial, moreover requires not to create action. Model View Controller is (MVC) is an architectural pattern. Moreover, it helps to separate an application into three main logical components. Each component handles specific development aspects of the application. The Model Components corresponds to all the data related logic actions that the user does. The View is used for UI logic of the application. And, finally, the controller acts as an interface between Model and View. Therefore, candidates those who are eagerly waiting to take the test can attend the MVC Quiz from the above section. Furthermore, we suggest the candidates take the test to improve your time management skills, accuracy, and speed. There are many benefits of practicing the MVC Quiz. Here we are providing you with some of the benefits that you obtain by practicing the test. Gain minimum knowledge on MVC. So, after the completion of the test, candidates have to click on Submit Test. And, after submitting the test, the aspirants have to wait for some more time to check their results. Moreover, we suggest the candidates not to refresh the page while taking the MVC MCQ Online Test.